Thinking of Getting a Divorce in New York? The decision to end a marriage is never an easy one. If you have made this difficult decision, then you will need the skillful and experienced legal services of a New York divorce attorney. 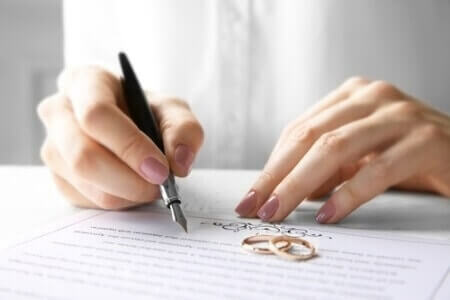 Eiges & Orgel, PLLC has been effectively assisting clients with the legal termination of their marriages for more than four decades. In fact, we have done so successfully in more than 3,000 cases. Divorce has become relatively commonplace in today's society. However, there are many legal professionals out there that do not live up to the standards of professionalism that are expected when handling matters of this nature. Additionally, many others do not take into consideration the emotional stages that are involved in the process. Make sure you receive the compassionate and capable divorce representation you need for your family law case. Turn to Eiges & Orgel, PLLC. Learn About Your Divorce Options. Call Us Today! How Do I Choose the Right Divorce Lawyer? These are matters of high importance that deserve nothing less than the best legal representation available. Therefore, we urge you to choose wisely. The lawyer you select to represent you could have a great impact on the outcome of your case. At Eiges & Orgel, PLLC, our New York family lawyers handle all matters of divorce. Whether your divorce is contested or uncontested, our attorneys can help you through all aspects of the process. All you have to do is give us a call to get started. In New York, property division goes by the principle of equitable distribution, rather than "community property." This means that, while the division should be equitable, it does not mean that assets will be split 50/50. The property that both you and your spouse accumulated as a married couple, and even some property accumulated before marriage, will be evaluated by different factors of fairness to determine which spouse most needs and deserves said property. In disputed cases, a family law judge will make the final decisions. Eigest & Orgel, PLLC is comprised of skilled professionals with over 40 years of experience. We pride ourselves on being able to adapt our services to meet the individual needs of our clients. Therefore, we act with compassion in the mediation of an uncontested divorce and with aggression when a contested divorce case calls for it. Whether you are looking to settle out of court or you need a legal professional to represent your case before a judge, Eiges & Orgel, PLLC will be there to stand by your side. Our firm understands that the process of ending a marriage is not an easy one. We have taken great care to provide high-quality representation to those who need it most, no matter what the circumstances of their case may be. Our firm will be there for you every step of the way, from the most complicated to the most standard family law matter. For all of your divorce and family law matters, you can confidently turn to an associate at our firm to help guide you through the legal process. Find out how our New York City divorce lawyers can help. Request a case evaluation today!